Despite its reputation as a one of the low-key, more ‘friendly’ races in the cross country calendar, the Dobson Trophy still presents a challenge to the runners with a fast, flat start followed by a climb of about 300m into the woods. 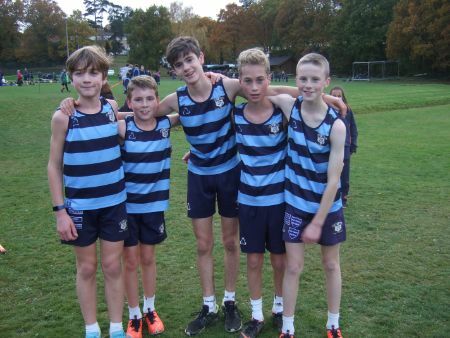 The fields are smaller than those at the Thomas Trophy and the Somerhill Regional, but the competition remains tough with runners from DCPS, Yardley Court and Derwent Lodge setting the bar high. Never daunted by the competition, indeed, rising to the challenge of a good race, the Saint Ronan’s boys continued to ‘punch above their weight’, finishing an impressive second overall, the U9 and U13 boys scoring the same points (36!) and coming second and third respectively. The races at Claremont comprise teams of six, with four to score. Our U9 scorers finished comfortably in the top half of the field with Oli H leading the team home in fourth, followed by Freddie F (6) who had a superb run, Louis A (9) and James M (17). Josh L (26) and Alfie A (38) completed the team, both running well. The U11 boys continued to pack well, with Jack E finding his form to run a nicely paced race, moving steadily through to finish seventeenth. Oscar B (23) displayed his trademark fight with Max M (25) running comfortably and Bertie A (28) continuing to develop as determined little runner. Jacob J (33) had a good run and Joshua E (51) should feel proud of his efforts. The field for the U13 boys was surprisingly small, but of a high standard, the boys up against very strong teams from DCPS, Yardley Court and Claremont. 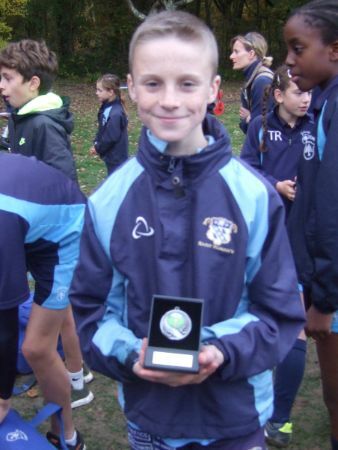 Charlie E, determined to improve on his fourth place from last year was rewarded with a silver medal following a superb run where he outpaced Jack W of DCPS but couldn’t quite catch the little machine that is Harry M (and he’s only an U11!). Ellison VR (5) had an excellent run on his old stamping ground, as did Jasper S (6) who is shaping up to be a great little runner. Max R had the unenviable task of being fourth scorer; despite his valiant efforts, he couldn’t break the Yardley group, but ran well to finish twenty third. Charlie M (28) had a good race and is earning his place as a solid member of the team. An excellent afternoon of running from the Saint Ronan’s boys!